I spent some time last week knitting up a couple of baby gifts. I don’t think the recipient reads this blog but, just in case, I’m not going to tell you who they are for. I will, however, show them to you. They’re just too adorable! The yarn is Socks That Rock lightweight, colorway Titania from the 2007 Rockin’ Sock Club. 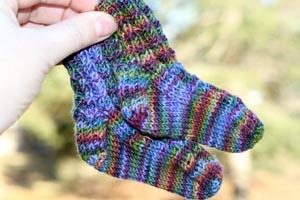 The pattern is Baby Cable Rib from Charlene Schurch’s Sensational Knitted Socks. I cast on 32 stitches on size 1 needles and they make a very nice baby sized sock. I just adore this little hat and it was as simple as can be. I cast on 80 stitches and just knit around and around and around until it was 3 inches. Then I decreased evenly and called it a day. I think it took less than 2 hours to knit. Talk about instant gratification! I hope the mom-to-be is as happy with them as I am. So cute! Sadly, my renewed knitting bug didn’t kick in until after my kids were bigger. Those little socks are so cute. 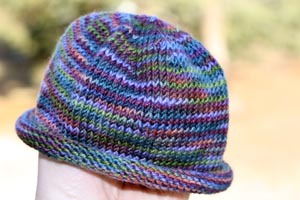 I have some nice sock yarn that I’ll never make socks from, maybe i should use it for baby hats too. How adorable!! I’m sure she’ll be elated!! Adorable! Guaranteed to make mother and child squee with delight!! Not much cuter than baby socks! Oh, the hat and socks are just so wonderful! The colors really look great. What a nice gift. So sweet! I especially love those tiny socks. Love them! I hope you get to see the baby wear them. That’s the best part. Awww. I just love baby knits. Too cute! They’re lovely and so is the colorway! SOOO cute!! Little hats are perfect for new babies. So cute I can hardly stand it. And, luckily, there are always babies to knit for. Those socks are the cutest! How could she not love them? The baby’s already reading?! Wow! What a smart kid. And super cute knits. Too cute. Love the yarn – I am going to go and look at that again! I didn’t realize how lovely that colorway was. Precious! Isn’t it fun to make such small things – instant gratification PLUS they’re adorable and useful too. So perfect. Those are the most adorable wee things ever! It’s amazing that the knits are that small and someone is going to fit into them soon. I’ve had a kid, and I’m still amazed at that. That’s on lucky baby!! They are perfect Carole. Those socks kill me with the cuteness!